Be the first to share your favorite memory, photo or story of Sabra. This memorial page is dedicated for family, friends and future generations to celebrate the life of their loved one. 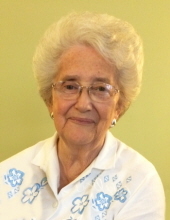 Mrs. Sabra Elizabeth Lawson, 80 of Berea, died Friday, October 5, 2018 in Danville. She was born in Winchester, KY on December 17, 1937 the daughter of Albert and Josephine Hudson Standau. She was a homemaker and a member of the Pine Hill Baptist Church in London. She was an avid reader who also enjoyed playing piano, flower gardening, cooking, babysitting, and dogs. She is survived by her son, Terry Lawson and wife Marlene of Wildie; a sister, Linda Standau of Danville; two grandchildren, Ashley Abney and husband Stewart of Louisville, and John Lawson and wife Jessica of Wildie; and three great grandchildren, Eleanor Hudson Abney, Lawson Stone Abney, and John Stewart “Jack” Abney. She was preceded in death by her husband of 61 years, Clyde Lawson. To plant a tree in memory of Sabra Elizabeth Lawson, please visit our Tribute Store. "Email Address" would like to share the life celebration of Sabra Elizabeth Lawson. Click on the "link" to go to share a favorite memory or leave a condolence message for the family.